We are about to see a mass deployment of public level 2 SAE J1772 charging stations, over 14,000 from The EV Project alone. This compares to fewer than 100 public Tesla charging stations (240V/70A High Power Connectors, aka HPCs). Over the next 12 months, I expect that the availability of level 2 J1772 chargers will totally overwhelm all other charger types. While most of these 240V chargers will be limited to 30A or 32A, J1772 chargers capable of supplying 240V/70A are available from Clipper Creek with many other vendors also working on charging stations. Teaming up with a number of other Tesla owners and members of the broader EV community, Cathy and I have been looking into what would be required to bring J1772 charging support to the Roadster community. The good news is that Tesla and J1772 use the same communications protocol to establish the connection and start/stop charging. This didn't happen by accident. Tesla Motors was involved early on in the development of the J1772 spec. 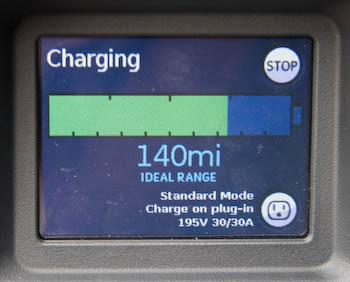 But the Roadster was designed before the new J1772 committee even got going, so the Tesla charging protocol was designed based on the old J1772 specification which used the Avcon connectors and limited charging to 40 amps. Tesla extended this protocol up to 70 amps, and successfully lobbied the J1772 committee to adopt this extension. Cathy and I have confirmed that the SAE J1772 JAN2010 spec exactly matches the amp limit waveforms produced by the Tesla HPC at all amperage limits from 12A to 70A. So, the Tesla Roadster uses the same communications protocol as J1772. (Except for the button on the HPC that can be used to start charging; I don't know how that works.) The only barrier to charging a Roadster from a J1772 station is the Tesla plug. We confirmed this by building a proof-of-concept adapter and using it to charge our Roadster at a Level 2 J1772 charging station in Olympia, WA, last Friday (Sept. 10, 2010). We'd like to thank Dave Denhart, Rich Kaethler, Chad Schwitters, Martin Eberhard, and Dave Kois for helping us with this proof-of-concept project. Thanks also to Jim Blaisdell of Charge Northwest for helping us find a level 2 charging station and getting us a ChargePoint Network card overnight. Our crude adapter is not a robust solution. As you can see it's quite bulky (since we didn't want to cut the cable to a working Tesla plug) and isn't watertight enough for general outdoor use. An upgrade to switch both the Roadster and HPC to use J1772 connectors. A compact adapter that converts J1772 to the Tesla connector. A new pigtail for Tesla's universal mobile connector (UMC). A new pigtail that requires purchasing a re-engineered UMC. A new pig tail for the current UMC (solution 3) isn't very appealing as the UMC is limited to 40A, cutting us off from any 70A J1772 chargers, while also requiring us to stuff a large, heavy, awkward cable into our trunks just to charge at a station that is guaranteed to have a cable that will reach our charge port. It's also not nice for those of us who have already invested in a different mobile connector, like the original MC240 or the RFMC. Solution 4 is even worse than 3 as it shares all of the problems and it would require everyone to purchase a new mobile connector. A compact adapter (solution 2) is better in that it could support the full 70A charging and also be quite compact, little more than a J1772 receptacle and a Tesla plug. It will still be quite expensive as it requires a Tesla plug. My guess is that it would cost at least $1,200 retail, based on what Tesla charges for the MC240 and UMC. It also has the downside of being an obvious target for malicious theft when the car is left charging unattended. Nissan Leaf owners won't have to leave an expensive, unsecured device dangling from their cars when charging, why should we? Full conversion to J1772 (solution 1) sounds radical until you see a J1772 receptacle. It's very close to the size and shape of the inlet in the Tesla charge port. Once I saw that, it required zero imagination to picture a Tesla Roadster with a J1772 receptacle in place of the proprietary Tesla charge inlet. The downside of solution 1 is that it would also require replacing the plug on our home chargers (HPC or mobile connector). This could be done by either replacing the cable, or by using the old Tesla inlet and a J1772 cable to make a Tesla-to-J1772 converter. The retail cost of an ITT Canon UL-certified J1772 receptacle and cable pair rated for 75A is $825 from Current EV Tech. I don't know of anyone else selling these newly-available connectors, but I do expect it to be a competitive market much larger than just Roadster owners. Even adding in reasonable labor costs, it seems to me that converting a Roadster and HPC should be near or below the cost of a J1772-to-Tesla adapter. I have been told that Tesla Motors is investigating ways to bring J1772 support to the Roadster which may include either a compact stand alone adapter (option 2) or a J1772 pig tail for the Tesla universal mobile connector (I'm not sure if this is option 3 or 4). They are early in the process and not promising anything at this point. From what I have heard, Tesla Motors is not interested in providing a full J1772 conversion (option 1) and hasn't even committed to supporting J1772 on the Model S.
It's possible the full J1772 conversion could be done even if Tesla Motors doesn't give us an official way to do it. I expect our group will continue exploring ideas in case we have to tackle the problem ourselves. We are several months away from having a significant number of Level 2 J1772 chargers installed in metro areas targeted by The EV Project, and even further away in other areas of the US. There's plenty of time left for both Tesla Motors and the owner community to explore possible solutions, but I believe this will soon be an important issue for every Roadster owner who wants to be able to take advantage of the soon-to-be pervasive J1772 charging infrastructure to conveniently drive beyond the Roadster's single charge range. This page contains a single entry by Tom Saxton published on September 14, 2010 3:00 PM. 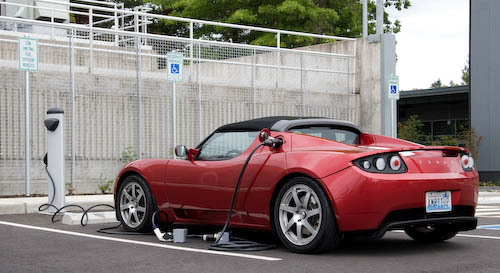 Tesla Roadster Charging Rates and Efficiency was the previous entry in this blog. An End to the Dark Ages of EV Charging is the next entry in this blog.